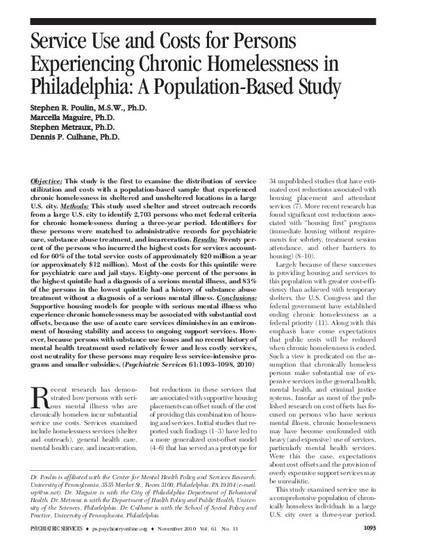 Objective: This study is the first to examine the distribution of service utilization and costs with a population-based sample that experienced chronic homelessness in sheltered and unsheltered locations in a large U.S. city. Methods: This study used shelter and street outreach records from a large U.S. city to identify 2,703 persons who met federal criteria for chronic homelessness during a three-year period. Identifiers for these persons were matched to administrative records for psychiatric care, substance abuse treatment, and incarceration. Results: Twenty percent of the persons who incurred the highest costs for services ccounted for 60% of the total service costs of approximately $20 million a year (or approximately $12 million). Most of the costs for this quintile were for psychiatric care and jail stays. Eighty-one percent of the persons in the highest quintile had a diagnosis of a serious mental illness, and 83% of the persons in the lowest quintile had a history of substance abuse treatment without a diagnosis of a serious mental illness. Conclusions: Supportive housing models for people with serious mental illness who experience chronic homelessness may be associated with substantial cost offsets, because the use of acute care services diminishes in an environment of housing stability and access to ongoing support services. However, because persons with substance use issues and no recent history of mental health treatment used relatively fewer and less costly services, cost neutrality for these persons may require less service-intensive programs and smaller subsidies.